Most little girls go through a horse-crazy phase at some point in their adolesence. There are several theories as to why this is; the most famous is the Freudian theory about little girl’s repressed desires and need to master something powerful to make up for their inherent weakness. Hogwash, I say, but anyway, whatever the reason little girls love horses, it’s good for the girls and good for the horses! Most women can remember clear as day the first time they sat on a horse. Maybe it was an old, arthritic pony not suitable for anything more than the occasional lead line ride. Maybe it was, as in the case of my mom, a hot Thoroughbred racehorse whose trainers were insane to put an 8 year old on its back. Whatever the scenario, it is a memorable experience because it is markedly different than, well, anything. Horses are big and they offer a whole new view of the world. A little girl all of a sudden gets a lot taller when she’s hoisted onto a horse’s back. This feeling, along with the feeling of going faster than she could on her own two legs, is very addictive. Once a little girl gets a taste of riding, she is likely to want more. If you’re a parent reading this, I advise you to cough up the cash for some riding lessons. I can almost guarantee you won’t regret it. The first reason is simple- confidence. When your six year old can get on an animal that outweighs her ten times, make the animal walk, trot and canter quietly, and maybe even convince it to jump over something, all the while making it look effortless, she will really have accomplished something! Horseback riding, like most athletic activities, is much harder than it looks. What you don’t see as the observer is how much muscle control, strength and balance goes into even the simplest of manouvers. Horses don’t naturally move in straight lines and perfect circles. They don’t naturally lower their heads and trot prettily around an arena. Your kid is making all of that happen. As your little girl continues to advance as a rider, you will see her confidence grow. Riding is HARD and your kid can do it! I have seen many a timid and shy girl blossom into a confident, outspoken and capable little lady simply by hanging out with horses and learning to ride. When a child rides, they may be able to get away with being a passenger at first, but soon they will have to take charge. There are many naughty ponies to thank for timid little girls learning to quite literally take the reins and take control. In the horse/human relationship, the rider is dominant and has to be for her own safety. 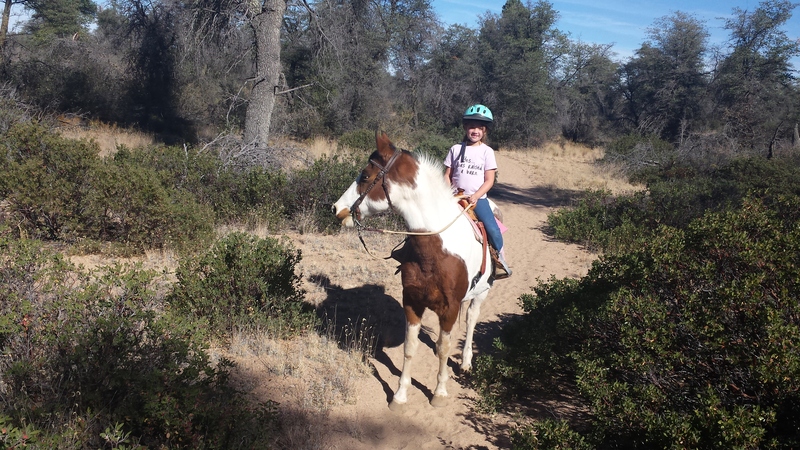 Riding teaches kids to lead, to make quick decisions and to trust their instincts. 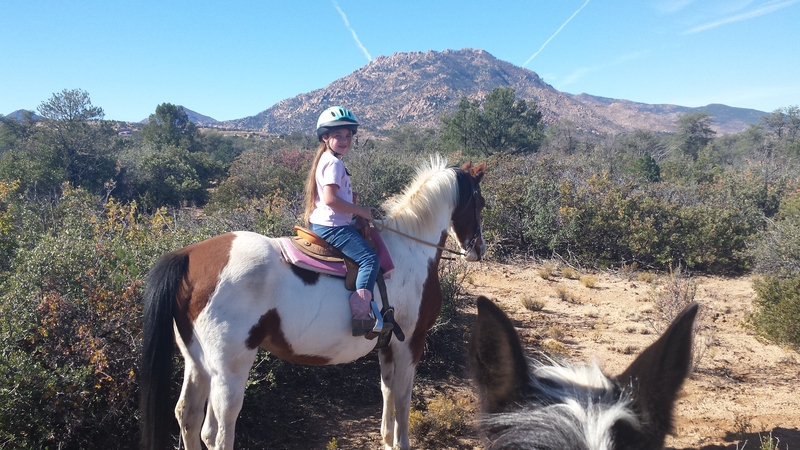 Your kid may think she’s taking a riding lesson, but really she’s taking a lesson in life. Horses also teach responsibility. If you haven’t noticed, they’re alive and have numerous needs. They’re a bit like very large, very heavy toddlers- they poop a lot and make a mess when they eat. Horses require hard labor- mucking stalls, hauling water buckets, unloading hay, cleaning tack, repairing fences, cleaning the barn, and the list goes on. All of these chores have to be done on a daily basis. Kids who are involved with horses learn to work hard and take pride in their work- another valuable lesson for life! In a society where girls are taught that their value lies in how they LOOK, horses teach little girls to place value on what they can DO. Would you rather your pre-teen spend her afternoon wandering around the mall looking for a push-up bra or master an automatic release as she flies over a three foot jump on horseback? Which do you think will instill tenacity, perseverance and confidence in her ability to set goals and reach them? As little girls grow into teenagers, having horses around can be especially helpful. Your teenage daughter can’t get wasted at her friend’s party because she has to be up at 5 a.m. to trailer to a show. She certainly can’t get pregnant, because everyone knows doctors frown on pregnant ladies trying to ride. If her boyfriend dumps her, so what? Her horse is cuter anyway. Horses give teenage girls something to think about beside boys, parties and all the myriad superficial things our consumer society is selling. I am convinced that horses give back far more than they cost in ways that are immeasurable and priceless. Many families have made sacrifices so that their kids could ride, show or own horses. The time and money spent on these endeavors has a return that will stretch into the child’s teen and adult years. Simply put, horses are good for girls. As a personal note, I’d add that horses are just good for people in general. Especially, children. We have been through so many life lessons with horses. Bullying, confidence, assertiveness, responsibility, what hard work feels like, what reward at the end of that hard work feels like, I could go on..and I could write an entire post on each of these “life lesson” topics but I will spare you (you’re welcome…). In a nutshell, we’re on the right path I think. With great teachers in our equines!